Manchester City manager Manuel Pellegrini took full responsibility for his side's alarming slump but refused to discuss his long-term future. United ended a run of four derby defeats with a convincing 4-2 win at Old Trafford that left City with their sixth loss in their last eight games. 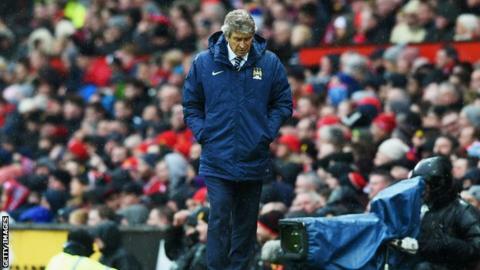 Pellegrini, 61, said: "It is my responsibility and the only way we can change this is by winning games. "I am not talking about my position. It is not important." City won the Premier League title last season and were level on points with leaders Chelsea in January, nine points above rivals United. But they are now four points below United in fourth and face being dragged into a fight to secure Champions League football next season as Liverpool could close the gap to just four points with victory against Newcastle United at Anfield on Monday. Pellegrini added: "The only way to explain our run is that we don't have the results. We lost many points, not only in this game which was a very difficult one, but in others too. "We played very well for 20 minutes but we must not play just for 20 minutes, we must play for the whole game in the same way. "We are concerned but now we must try to win the next game at home to West Ham. We have been first or second the whole year and now we are fourth but United and Arsenal have to play against Chelsea. We have 18 more points to play for. We must not be dramatic." City faded after taking the early lead through Sergio Aguero and Pellegrini conceded that United's stirring comeback may have affected his team's fragile spirit. "Maybe it is something we can be concerned by," he said. "It is easy when you are two goals in front to play with more trust than the team that is two goals behind. "We made important mistakes for the second goal and the third was offside but the result was a fair one."